Just 1 Step: Tomatoes, anyone? And a recipe! 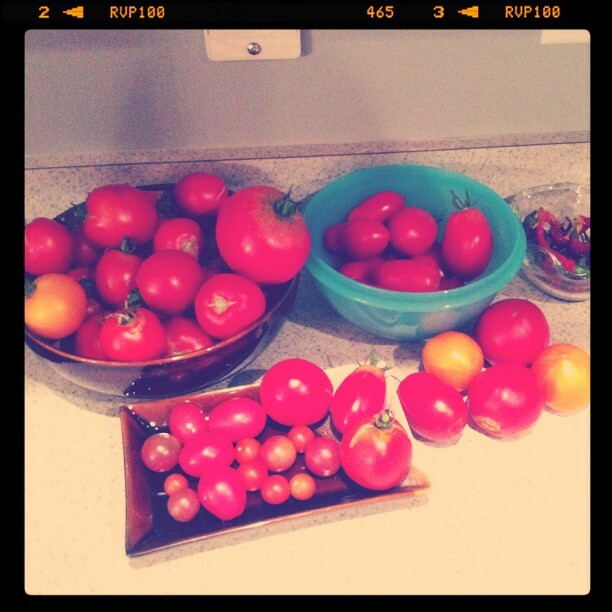 This is the second year that Dave and I have a) had a garden and b) grown tomatoes. This is also the second year that we've found ourselves with more tomatoes piled on our kitchen countertop than we could ever eat in a lifetime. I don't know if this is typical for gardeners who grown tomatoes, but Dave and I have tomatoes coming out the wazoo. If you don't think that pile is impressive, than may I mention that we've given away at least an equal amount, if not more, to our friends? And that Dave has been eating tomato sandwiches like three times a week? And that I have been eating tomatoes in my salads and as a snack almost daily? And that I had just used up about 50 cherry and black cherry tomatos in a recipe (see below)? Oh yes people, it's for real. We have a tomato problem. 1. Cook the spaghetti according to package directions. Drain and set aside. 2. While pasta cooks, pour the oil into a large skillet over medium heat and add the garlic. Cook, stirring frequently, until garlic is golden brown, about 10 minutes. Add the tomatoes. Increase heat to medium high, cover and cook until tomatoes are warm and softened but still retain their shape, about 3 minutes. 3. Add pasta, 1/4 cup each of the basil and Parmesan, and the salt and black pepper to the tomato mixture and toss to combine. Top with remaining cheese and basil and serve. 1. Cook up some gluten-free spaghetti noodles so you don't get a tummy ache after dinner. 2. While pasta cooks, pour some olive oil in a large skillet over medium heat and add a bunch of pre-minced garlic. Try to eye-ball approximately four cloves. (Good luck.) Cook, stirring frequently, until garlic is golden brown. 3. Cut up all the cherry tomatoes and black cherry tomatoes that are sitting on your countertop. 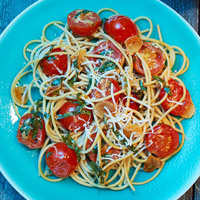 Feel relief at the realization that you do not have to eat a pound of cherry tomatoes for lunch this week. 4. Add the tomatoes to the garlic. Cover and cook until warm and softened. 5. Slice up lots of basil leaves, taken from the basil plant sitting in your kitchen. Add them to the mixture. 6. Dump in the remains of your grated parmesan cheese container. 7. Drain the gluten-free noodles and rinse well. Add to the garlic/tomato/basil/cheese mixture. Stir and stir and stir. Realize that rice noodles like to hang out in clumps. Add some olive oil and stir and stir some more. Announce to hubby that the noodles are kinda all hanging out in a pile, but they really should be delicious. 8. Serve to son and hubby and all three together decide that the dish is in fact delicious. Mmmm mmmm mmmm. Dave said I could make this recipe at least once a week because of how much he liked it. Next time we'll probably cut up some of our other types of tomatoes and try them out. I'm hoping it still tastes as good.